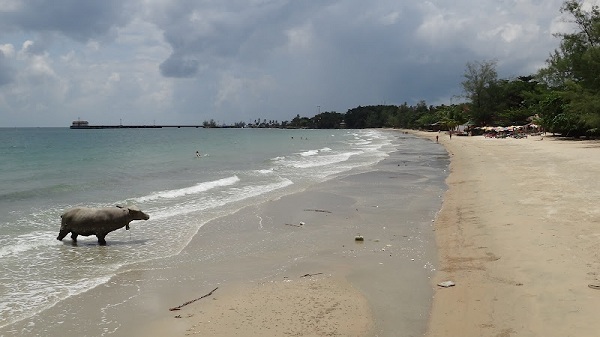 Tourist visits to coastal Sihanoukville have increased in the first three months of 2015. PHNOM PENH, (Khmer Times) – Preah Sihanouk province, some 240 kilometers southwest of Phnom Penh, received 533,830 tourists in the first three months of 2015, up 19.95 percent compared to the same period last year, an official said. Tourism Provincial Director of Preah Sihanouk, Nou Sophal, told Khmer Times that in the first three months of this year, the province recorded domestic tourist numbers of 406,609, up 23.82 percent on the same period last year. At the same time, 127,221 overseas tourists visited the province, an increase of nearly 10 percent compared to last year, Mr., Sophal said. Of these, 15,606 arrived in the province by ship and 16,888 came directly by air. Chinese tourists topped Sihanoukville’s tourist list in the first quarter, followed by those from Russia and Vietnam, who ranked second and third, Mr. Sophal said. Sihanoukville, one of the country’s three most attractive tourist destinations, is expected to see an increase in the overall number of tourists this year, the Tourism Provincial Department Director said. By the end of 2014, Sihanoukville welcomed 1,327,748 tourists, an increase of over 28 percent compared to 2013, according to official figures. One of the key drawcards organized by Cambodia’s Ministry of Tourism is the Sea Festival, which will run annually at the country’s four coastal provinces, including Sihanouk, Koh Kong, Kep and Kampot. The purpose of the event is to promote the potential of coastal tourism sites and to generate income for local businesses and residents.